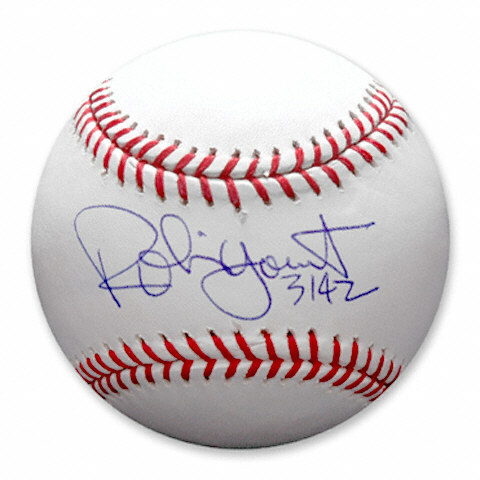 One of the most popular players of his era, Robin Yount cards and autographed memorabilia are still appreciated by collector's today. Yount spent his entire 20-year career with the Milwaukee Brewers. Upon retiring, he amassed 3,142 hits, a career batting average of .285 and 1,406 runs batted in. His Hall of Fame-worthy numbers were acknowledged in 1999 with his induction his first time on the ballot. 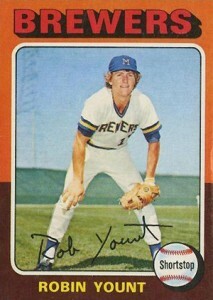 Robin Yount has rookie cards, all produced in 1975. He also has three oddball cards that might not be seen by most as rookie cards, however, player collectors still acknowledge their importance. All three of Yount's rookie cards are very similar in design. The most iconic is found in 1975 Topps Baseball. He also has a shrunken down version in 1975 Topps Mini Baseball. Finally, there's the 1975 O-Pee-Chee Robin Yount that is virtually identical to the Topps cards. Among the early oddball Robin Yount cards are two in 1975 Hostess. The 1975 SSPC card is among the toughest early Yount cards. Robin Yount's first certified autograph cards were produced in 1999 by Upper Deck. He has autographs in 1999 SP Baseball and two in 1999 Upper Deck Retro. His first memorabilia cards came in 1999 Upper Deck Ultimate Victory. 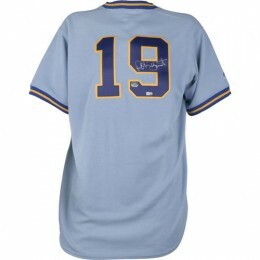 With regards to the value of Robin Yount's autographed memorabilia, it is reflective of the fact that he is widely considered to be one of Milwaukee's all-time greats. As a member of the 3,000 Hit Club, he is a must for many collectors. A willing and friendly in-person signer, Yount also participates in the occasional regional and national sports collectibles show. Identical in design to the standard Topps card, the primary difference is the bilingual card back that's in both English and French for the Canadian market. It's also significantly tougher to find that its Topps cousin. The two-tone borders of the 1975 Topps baseball set are divisive among the collecting community. Some love them, others loathe them. The large shadowed block letters on the top of the card made searching for your favorite team very easy. A facsimile signature, player name and position towards the bottom of the card provide just the right amount of detail. The player image is large and in this case is a posed photo of Yount in the field. While the card isn't quite as valuable as it once was, it's still one of the most iconic and popular cards of the decade. These mini cards are part a limited test release. This makes them rarer than the regular Topps version. It has the same design as the regular issue but shrunken down to 2 1/4" by 3 1/8". 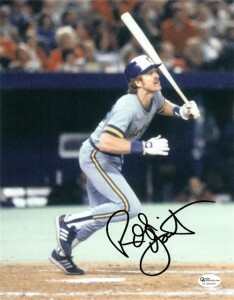 Below you will find an example of what Robin Yount's authentic signature looks like. This can be used as a first point of reference for determining the legitimacy of autograph memorabilia, but is not a substitute for having your items authenticated by a well-respected professional autograph authentication company. Some of the trusted sources within the sports memorabilia market include the following companies: PSA, JSA, Steiner, Mounted Memories and Tristar. Click on any of the images below to view full size photos. A very easy to discern signature written in cursive. The signature is written on a slight elevated plane for the first name and near horizontal for the last. The signature is defined by the over-sized letters "R" and "Y." The "R" is printed with a large guitar pick shaped loop. The "o" and the "b" are written so that the first flows into the second without a pen lift. He uses the rise in the "b" as an implied "i" with just a dot and it also serves as the letter "n."
The "Y" is lower case in nature with a swooping line that again forms a guitar pick shape. The "o" is similar to the first but slightly smaller, the "u" and "n" are formed in a way that they look nearly identical. The signature finishes with a crossed "t" resembling a star because the pen does not lift for the cross. Robin Yount Signed Authenticated Color Glossy 8x10 PSA DNA Certified - NICE ! !